SOCIAL JUSTICE EDUCATION: Rep. Kevin “Coach” Christie, D-Hartford, speaks to the House Education Committee about H.3, a bill that aims to push social and ethnic studies in pre-K-12 education. 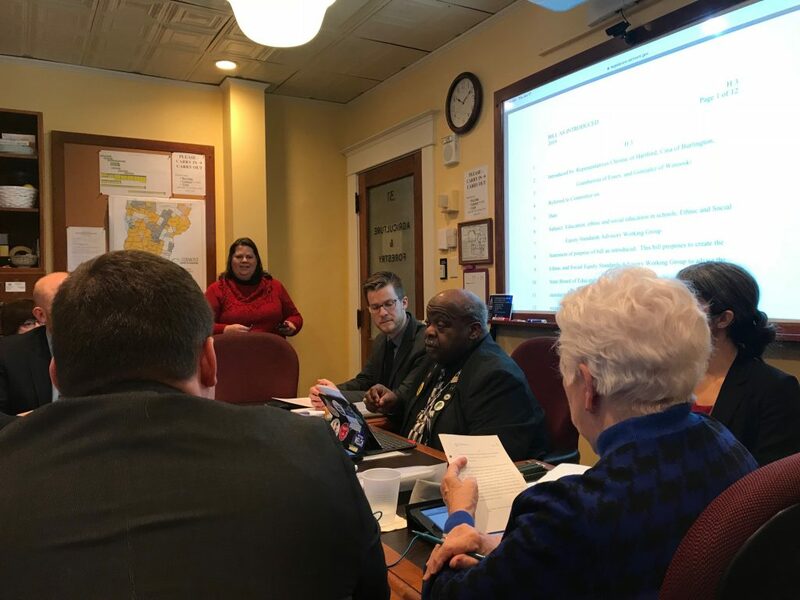 MONTPELIER — The House Education Committee on Thursday voted in favor of creating a work group to recommend new academic standards that recognize the history and contributions of ethnic and social groups and movements. The bill, H.3, aims to reform how social and ethnic issues are dealt with in the classroom. Students as young as pre-kindergaren age could see their learning experience modified according to this bill. Last week, the committee heard from three sponsors and did a walkthrough with legislative counsel on Thursday morning. Sponsors of H.3 include Rep. Kevin “Coach” Christie, D-Hartford, Rep. Dylan Giambatista, D-Essex Junction, and Rep. Diana Gonzalez, P-Winooski. Rep. Brian Cina, P-Burlington, also a sponsor, did not take part in the presentation. According to the bill language, H.3 would “create the Ethnic and Social Equity Standards Advisory Working Group to advise the State Board of Education on the adoption of ethnic and social equity studies standards into statewide educational standards.” It also would require the board to publish data on student hazing, harassment and bullying incidents aimed at racial and ethnic groups, and other minorities. The bill is similar to last session’s H.794, whose lead sponsor was former Rep. Kiah Morris, D-Bennington. That bill stalled in committee. Christie, who is an African-American state representatives, explained why he thinks the bill is necessary. “People say, ‘Don’t we kind of already do that on a day-to-day basis? '” he said, speaking of discussions on racism and equality. He went on to explain that 300 people were killed during the Tulsa race riot, which was initiated by an attack by white supremacists. He shared the story to emphasize that certain aspects of American history are not taught well enough, or at all. He offered other examples of history overlooked in many of today’s classrooms. Christie, who was a technical education teacher in the 1980s and ’90s, said he takes pride in promoting a positive climate in the classroom. Giambatista, a former band musician, said Vermont students need to learn more about minority groups. “We do need to evaluate how we teach the human experience of all citizens in this country — the prolific experiences of individuals in this country who historically have not been well represented,” he said. Although not specifically mentioned in the bill, Gonzalez recommended creating a curriculum using material and policy recommendations by the left-wing Southern Poverty Law Center and Anti-Defamation League. Christie told True North that First Amendment free speech must always be protected, even when it comes to the goals of H.3. He added that the recent decision by Vermont Attorney General TJ Donovan not to prosecute verbal harassment against Kiah Morris is, in his perspective, proof that free speech is as well-protected now as ever. How a social justice curriculum for schools would be created is unclear in the bill. The State Board of Education, while it may adopt standards, does not write curricula. The ugly face of (real) racism shows itself again. Keep your kids home, Mom and Dad. Or send them to a private school. The public schools are starting their indoctrination early on in the development of children. Indoctrination…NOT education. This is dangerous to your children’s mind and soul. And so are these people. I suppose you are against children being taught see something,say something about their parents too. Private and Home Schooling have proven to be far superior in outcome over the leftist indoctrination in public school. Now wanting more leftist hate from corrupt splc as a road map to teach kid manners just shows the stupidity that abounds in Montpeculiar. The rest of world know they are not a credible org since the 70’s when they were fighting the Dem KKK. You are joking right, Herr Boudreau? An armed group of blacks went to confront a group of whites gathered at the Court House, where a white Sheriff was protecting a black man accused of a crime. The white Sheriff and his Deputies refused the help offered by the armed black group and refused to turn over the defendant to the crowd. It appears to me that the white Sheriff is the hero of this story. The first skirmish resulted in 10 dead whites and 2 dead blacks. Then the real fighting started and the blacks got their butts handed to them. It appears as though Christie doesn’t even know the story of what happened in Tulsa. Until slave reparations are made,this is all just lip service.The generational wealth that was created on the backs of slavery must be repaid.Yes I’m talking about confiscation of lands and monetary wealth derived from the toil of slaves.While it’s hard to trace where that wealth has gone the black people and American Indians deserve a 50% confiscation from the whites of this country. Come and take it Mark. We will! Our allies arriving daily from south of the border will ensure success. Are you by chance related to Frank Duquette the founder of Duquette MN, that happens to be a relative of mine. Been doing family research and Frank is a relative that came from Quebec and settled in MN, a businessman. Indians once had that lands and BNSF railroad is there. Quite a history. Should have known you don’t have the guts to back up your rhetoric. Fine. Ante up, Mark. I never had a slave, I don’t have one now. Reparations were paid by the deaths of my Civil War ancestors. You can pay them if you want. As P.T Barnum said, “There’s a fool born every minute”. I agree we need to get back to basics! We also need to get to the bottom of all the federal funding we are getting for special needs children. As tax payers we must ask why they have rubber rooms for our children who act out! Is this what all that funding is getting? Maybe they should not be in a regular school, but in schools equipped to take care of their needs. This is upsetting for all children and hurts the learning for those that can do the work. No instead we create new useless laws. This is not their job. There was a similar article by TNR in which I pasted two sites about how corrupt and greedy SPLC was. My post was in response to a Liberal protesting person in that article saying she gets notifications from SPLC. Thought if she could read, and therefore read the article comments she might get educated as to what she was supporting. Reported that the SPLC was behind the Middlebury student revolt against free speech. Absolute corruption in VT.
SPLC is a hate group! All this current brand of “social justice” accomplishes is the exact opposite of social justice. Racism is back in style, big time, but now it is OK to hate people for the color of their skin, if they are identified as “white”. Yet it was white people who saw and were sorry for slavery and discrimination, and tried to eliminate them, everywhere. Discrimination is illegal, and two wrongs never make a right! Even now I get accused of “white privilege” even though I never discriminated against anybody on account of their skin color, and everywhere I worked was integrated. I thought the goal of social justice was to do away with that, but instead, it has a new, ugly, stupid face. The ultimate goal is to destroy our country and everything good in the world. It is satanic. I would like to ask Rep. Kevin “Coach” Christie, what percentage of his poll knew happened in the Great Barrington, MA courthouse, August, 1781. Re: Brom and Bett v. Ashley. Google it. Indeed, everyone should learn as much as they can about the founding and continued development of our exceptional American experiment, its trials and its tribulations. How about teaching these kids to read and able to do basic math. was ponced on by these same SocialJustice Warriors for mouthing the correct answer, ,Assimilate. Yet our students don’t know the difference between democracy and a constitutional republic. Students don’t know the basics, the foundational strengths that makes America and all Americans so fortunate, but will know something about a bunch of racist thugs, who don’t represent America or even a small portion of America. The story of life is struggle and overcoming the struggle, matters not who you are. Social Justice Programs promote envy, jealousy and hatred, they divide, they don’t come together. But worst, worst of all is Social Justice Programs take away hope. They plant the seed that you can’t succeed due things you can’t control, taking away peoples hope is a lie and extremely cruel. But then social justice is not about lifting people up, it’s about division, hatred to ruin a perfectly good republic.